I had a feeling it was coming. Like the Richard-III-under-the-car-park lady whose every nerve fizzed when she peered at a dried-up old tibia in a trench, I sensed an outing was afoot. It’s why I published Disunited as rapidly as I could. Robbie Rogers, of Leeds United and the US international team, has come out. He’s not — and I’m sure he’d be the first to agree — the most famous footballing name in this country. At least, he wasn’t. But it was never likely to be someone at the very top of the game who would be first to jump out of the closet. All the reaction I’ve seen on Twitter and elsewhere to Rogers’ announcement has been positive: from his teammates, from the authorities, from respected elders such as the blessed Gary Lineker (crisps be upon him), and of course from the gay community. To my surprise even people sending him messages on Twitter — numbering in the several thousands it seems — appear universally to be praising him. If there are negative reactions, they’re drowned out by the positive. It’s a heartwarming response. But the good wishes are sprinkled with disappointment. Please don’t retire. Put your boots back on. Shame you had to quit. The sad truth is that Rogers has decided to stop playing, with immediate effect. He’s not, after all, going to be the first out gay player in the British game since Justin Fashanu: he’s going to be one of the many sportsmen who waited until retirement before coming out. In fact it’s worse: he retired, seemingly, expressly so he could come out. Painfully honest, and moving, and damning. No outpouring of support and best wishes and congratulations from teammates and authorities and elders and strangers can whitewash the blunt truth: even today, even after anti-discrimination laws, even after civil partnerships, even after the House of Commons voted overwhelmingly to support equal marriage, in football it seems you can be gay — or you can play. The sport should be ashamed of this reality. The PFA fully supports Robbie Rogers in taking the courageous decision to announce that he is gay. The FA has issued a similarly weedy press release. Eight short paragraphs — three of which aren’t about Rogers at all — patting itself on the back for doing the barest minimum. Messages like these from the FA and PFA are sonar pings: simple acknowledgements of simple truths. Glossy FA brochures and platitudes about “support” cannot make up for the years of fudging, of shelved campaigns, of pocket-money fines, of lack of any substantial action. In my view the leadership of the PFA and the FA should be prostrating themselves before the media begging forgiveness. They should be admitting that their organisations have failed utterly to support gay players, by not speaking out and acting more strongly against homophobia within the game. Homophobia such as anti-gay chanting from travelling supporters towards the home crowd at Brighton and Hove Albion, which has become worse in recent years. Even last Tuesday the Blackburn Rovers player Colin Kazim-Richards allegedly made homophobic gestures towards fans on “at least five occasions” during their match at Brighton. Kazim-Richards is an official campaigner for Kick It Out, the FA’s anti-racism initiative. The authorities take racist behaviour seriously, and yet don’t seem to treat homophobia in football the same way. This fails gay supporters — of which there are many — and it fails gay players. It is the responsibility of the FA and the PFA to make the game safe for gay players to come out, just as it is their responsibility to rid the game of racism to allow players of all backgrounds to succeed. Just as the game — not the player — would be shamed if a non-white player retired rather than play in an atmosphere of hate, the game is shamed when a gay man like Robbie Rogers does the same. Good news, everyone! 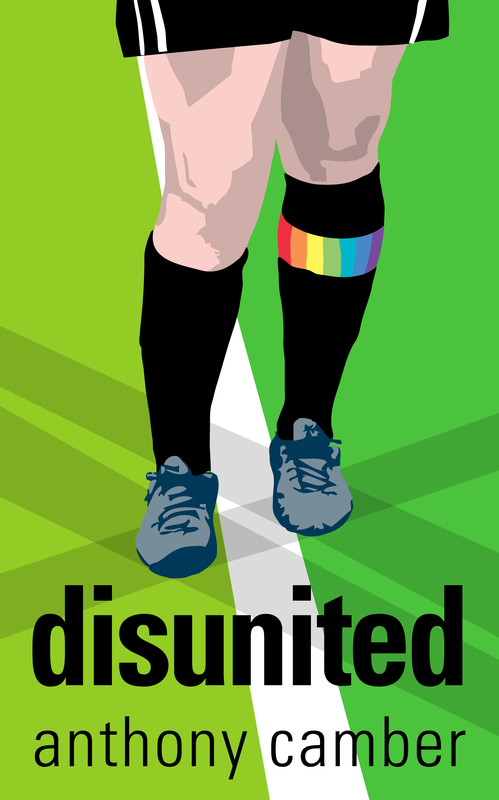 You can now buy Disunited for Kindle in the usual places, such as Amazon UK and Amazon US. It’s also available for Kobo, and via Lulu for other ePub-capable ereaders. In the next few days, fingers crossed, the book will also be available for iPad, iPhone and iPod Touch on the Apple iBookstore. And within a week or so it should appear on Amazon in paperback form. UPDATE Feb 1st: It’s also now available for iPad, iPhone and iPod Touch, and on Amazon in paperback. As usual the cover has been designed by Blogshank. I love it. The story’s just over 97,000 words in total and the paperback runs to 326 pages. Fans of Thora Hird, and I know there are many, will be delighted to learn that she does indeed make her traditional ceremonial appearance. As always I’m grateful for any and all feedback, positive or negative. Feel free to leave reviews on Amazon or wherever you park your cursor. Tell your friends! Buy it for your family! Convince me I should narrate the audiobook! But first, I’m going for a lie down. A couple of years ago I wrote a short story — very short, only about 1500 words — set in the dusty office of the manager of a football club. A young, talented member of his team came to him with a confession: he was gay. More than that, he wanted to come out publicly. The story played out as an exchange between the two, with a not particularly twisty twist at the end. It was inspired by the then-recent decision of FIFA, football’s world governing body, to award the 2018 World Cup to Russia and the 2022 World Cup to Qatar. For an organisation allegedly committed to stamping out discrimination in the game, the decision was and remains incomprehensible: homosexuality is barely tolerated in much of Russia, and is illegal in Qatar. It’s as if FIFA had awarded the World Cup of 1978 to South Africa, at the height of apartheid. The player in my short story looked ahead to 2022, when he might be out, happily married, with kids — and playing for England. Would the FA not allow him to be selected, to avoid offending the hosts? Would Qatar turn him away at the airport, along with any other players that might be out by then? Of course not. The authorities in Qatar could surely do nothing but let him and the others play, or risk the condemnation of the international community. They would have to let in his partner, if he had one. Any other action would be intolerable, and worthy of a boycott. I’m sure that by 2022 this won’t be a hypothetical scenario. I’m convinced that there’ll be out gay male players in the top football leagues around the world, and it’s more likely than not that at least one of the 32 national teams in Qatar will field an out gay player. But currently there are none at the highest levels of the game, nationally or internationally: the only out gay man currently playing is Anton Hysén, in the third division of the Swedish league. In Britain, the only out gay player so far has been Justin Fashanu, twenty years ago, in a different world. I don’t believe this will remain the case for long. I think that within a year — possibly this summer, between seasons — someone playing in the English or Scottish Premier League will come out. I don’t know who, I don’t know where — I have no inside information — it just feels as if it will happen. A momentum seems to be building, almost as if a growing number of people are being let into a secret and then voicing their support without naming names. Eventually there’ll be a critical mass, a tipping point, and the unnamed player or players will come out. Perhaps: I don’t know. But this gut feeling is why I’m in a hurry to publish my next book. Called Disunited, it’s set at a football club I don’t name, in a city I don’t name, in the present day. It’s about a newly signed rising star of the game called Danny Prince who becomes — reluctantly — the first British player to come out since Fashanu. It’s my usual mix of humour and seriousness, and — in case you might be put off — it’s not a football book, full of arcane gags about the offside rule. The first top footballer who comes out in the UK today will face many struggles on and off the pitch — dealing with his teammates, his manager, and not least his supporters — but the story’s about universal human worries: loyalty, honesty, risks, relationships, and remaining true to yourself. The book will be out in early February, which happily coincides with the Football v Homophobia month of action and LGBT history month. I’ll publish a sneak preview here when it’s available.